At the edge of the famous ski resort of Kitzbühel-Kirchberg lies the cozy village of Hollersbach. The ski lift (Panoramabahn), which is located in the immediate vicinity (about 800 meters) will take you directly into this beautiful skiing and hiking area, you can't get any closer to it than this! 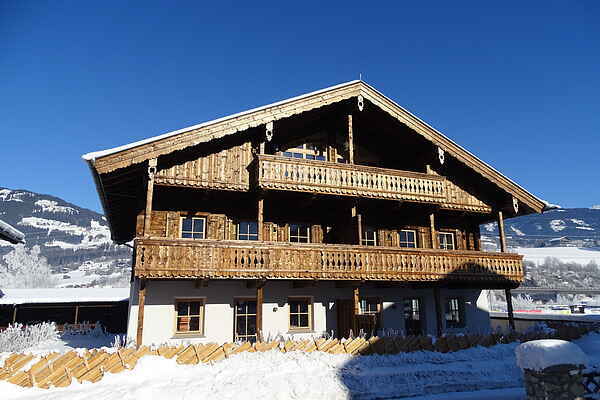 This small scale apartment complex, newly built in 2016, boasts splendid views across the surrounding mountains and the beautiful lake of the Hohe Tauern National Park. You'll occupy the apartment on the 1st floor which is spaciously, but also luxuriously decorated with much attention to detail. The magnificent living room with open kitchen has plenty of space and offers direct access to the sunny balcony. You will also have 3 separate bedrooms and 2 bathrooms, one of which has a wonderful Finnish sauna. The direct surroundings offer numerous hiking and mountaineering opportunities. You can also explore the entire area by bike using the Tauern Radweg. Refreshment is available in the nearby Hollersbacher Badesee, which also features a large children's playground and tennis, football and volleyball courts. Prefer to play golf? An 18-hole golf course can be found in nearby Mittersill (7 km). Skiing, snowboarding or ski tours; because you're close to the lift, you can be in the beautiful ski resort of Kitzbühel in a few minutes. Tobogganing, snowshoeing or sleigh riding can be done everywhere in the area and it's highly recommended to go tobogganing at night, after a day of skiing, on the longest natural toboggan run in Europe (14 km) in nearby Bramberg - there even is a free \"Toboggan train\". The caretaker offers an additional grocery shopping service. She will contact you by email around one week before arrival and will send you a shopping list. If you are interested, you can indicate which groceries you would like to have stocked when you arrive. She will take care of the shopping and you will find the requested items in the kitchen when you arrive. It will save you time and cargo space!